Incoming freshmen must be 14 years of age by September 1st. Students born after that date are placed on a waiting list. Students must have a good standing academic, attendance, and behavior record. Students must also be eligible and willing to work. Prospective students must apply while they are in 8th grade. Applications are available in September. You will need to submit 7th grade report cards as well as 8th grade. Recommendation letters will need to be submitted by the Principal/Counselor, English, and Math teachers. The students will also need to register for a placement test and an interview. All families need to apply and be eligible for financial aid. No, students of all faiths or denominations are welcome. The school is open to all; however, it should be understood that it is a Catholic, Jesuit institution. Religion classes, monthly liturgical celebrations, and spiritual retreats are part of the school. Starting in November, we have a total of 12 Shadow Days where your student can shadow a Cristo Rey student for half a day. We hold 2 sessions per month until the end of April. This program is very special because not only does your student learn about our school, your student also gets to experience our environment and see first-hand if this school is a fit for them. It is easy and simple to register your student. All you need to do is call the Enrollment Office or fill out a registration form. We also offer personal tours. Feel free to call anytime! The Cristo Rey Uniform consists of our very own purple Cristo Rey polo or long sleeve, black dress pants (no jeans or sweats) and black dress shoes. Vans, Toms, or similar style shoes are not acceptable. Red and blue articles are strictly prohibited. 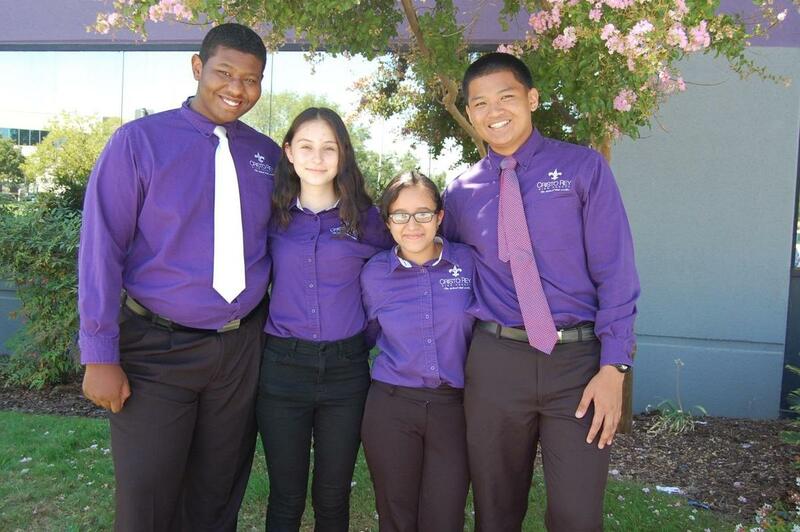 Cristo Rey has a unique program that provides all students with a sponsored job that not only helps students offset the cost of their tuition, but also prepares them with important work skills, confidence, and accountability within the greater Sacramento area. All students receive training during our intensive Summer Institute Program. It also helps pay $7,000 of the tuition of the student. Does my child need to work? Absolutely! We have 35 Cristo Rey High Schools in our network and all schools require students to be eligible for work. Can students choose their jobs? All students are interviewed and based on their interests and skills we may place them accordingly. Depending on the student’s grade level and job placement availability, the individual student may be placed in the field of their choosing. Are you a closed campus? Our campus building is closed to the public. We only allow entry through our front office which remains locked and must be opened from the inside by a Cristo Rey employee. How rigorous are the classes? We are a college preparatory school which meets the A-G requirements. We offer advanced and AP courses for students. The number of available positions is determined at the end of the school year by the administration and is contingent on the current enrollment for each of these classes as well as the enrollment of the entire school. Do you take transfers during the school year? Unfortunately we do not because all students must first complete their summer institute training. Transfer students can start applying in January for the following school year. We have a variety of sports your student can choose from all year long. We offer track & field, basketball, volleyball, soccer, and cross country for both boys and girls. Unfortunately, we do not offer confirmation classes. You may call the Enrollment office and they will assist you in finding a location near you.